The NBA is excited to announce that registration is now open for our 3 on 3 summer league. 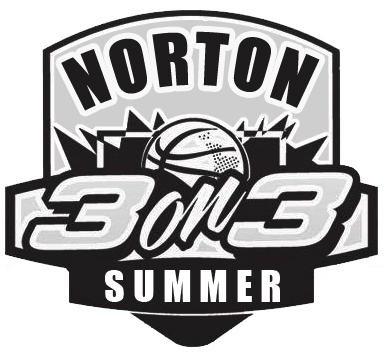 This league is open to all Norton Boys entering Grades 3 thru 9 and Girls entering Grades 3 thru 9 next year. Games will be played Tuesday evenings at the outdoor courts at the Norton Middle School. Girls will play from 6pm-7pm, Boys will play from 7pm-8pm. Games will start July 10 and will run for 7 weeks to August 21. The cost of this league will be $60. Each child will receive a reversible jersey to keep. If you have any questions regarding our 3 on 3 Summer League please email Rob Todesco @ . *The following rules are general three on three rules, NBA organizers may make minor adjustments as they see fit to make the game operate for the participants. Starting Play: The ball must be thrown in from the top of the 3 point line. No Dribbling the ball in. Shut out: If a team is up 10-0 then the team with 10 wins by shut out. Checked Ball: The ball must be “checked” by an opposing player at the top of the 3 point line (take-back line) on each dead ball change of possession, before it is put into play. The ball, (after being checked), must be passes to a teammate to begin play. Jump Balls: All jump balls go to the team on defense. Stalling: Stalling is not allowed. The referee may institute a 20 second shot clock at any time. Failure to attempt a shot in 20 seconds after being advised by the referee will result in loss of possession. Time Outs: Each team is allowed One 30 second time out. The clock will stop during the time out. Taking It Back: The ball will be “taking back” on every change of possession. “Taking back” means BOTH feet must be behind the two-point arc (3 point line). Failure to take it back is a violation. After one warning from the referee, a failure to take it back will result in change of possession. 3 Seconds in the Lane: Offensive players may NOT remain in the lane for more than three seconds or the ball will be turned over to the opposing team. Scoring: Baskets made are scored as 1 point except behind the 3 point line, those are scored as 2 points. The referee/scorekeeper records the foul. Defending team receives the ball. If the basket is missed, the player must attempt a free throw. Free Throws: Free throws count as one point and one shot is given on a foul in front of the 2 point arc. When fouled in the act of shooting, free throws are awarded to the shooter only when the basket was not made. All free throws are dead balls. Regardless of whether the free throw(s) are made, the opposing team “checks” the ball from behind the two point arc (3 point line). If a player is fouled in the act of shooting a 2-point shot (behind the 3 point line) and the shot is not successful, the shooting player shall be awarded two free throws. DURING FREE THROWS ATTEMPTS– ALL PLAYERS REMAIN BEHIND THE TWO POINT ARC. Technical fouls: A technical foul results in ONE (1) free throw and possession to the free throw shooting team. If a player/coach gets called for 2 technical/flagrant fouls in a night there will miss the following weeks game. Clearing the Ball: When the other team gets the rebound they must clear the ball to the 3 point line. Both feet must be behind the 3 point line or the play does not count. 1st time will be a warning if it happens more than 3 times there will be a change in possession. There is no defense when clearing the ball unless the team has over 12 points OR there is 2 minutes left in the game. Out Of Bounds: If a ball is out of bounds the ball will go to the top of the 3 point line to be checked and thrown in.